Yes I know this probably goes against the grain and everyone has their own favourite way of doing things but I really get fed up sewing in ends and decided to give this method a go. It works well and the knots are so tiny they disappear into the knitting. If I add yarn to the edge of the work I would not use this method and sew in the ends but for mid row this is fine. It adds interest to the scarf and uses up the complete ball of scrap yarn as well, this means the scarf has 7 different colours in it. 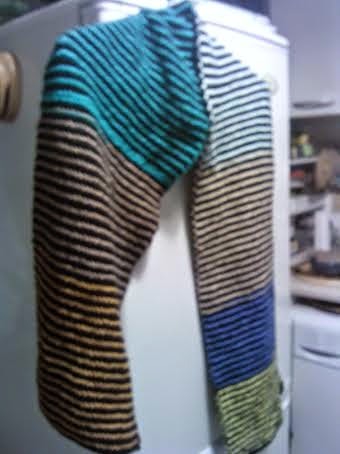 I knitted 2 rows black and 2 rows in the new colour throughout the scarf ending with 2 rows in black before casting off. A simple Garter stitch scarf on 5 mm needles using 50 stitches, the scarf is just over 60 inches long. I will wash it when I have made the hat and then post it off. The hat is easy to make as well an easy rib pattern. I have made the scarves and hats for them before and they use up stash nicely and bright colours are welcome as well. 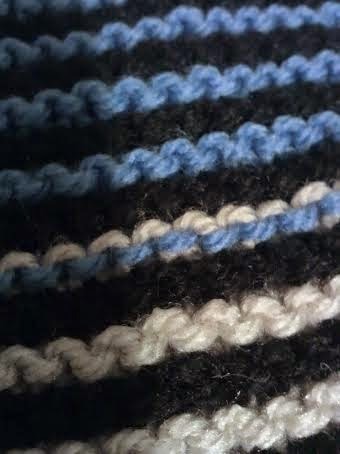 I created stripes as I have a lot of black yarn and loads of odd balls of yarn to use up.